When I first decided to put up this column, Daily Takes, I planned it as a ‘crisp’,’ concise’ & a subtle piece opining on current issues concerning India & the world. Breaking from the norm, today we’re to address something that would in the end decide how successful the Indian nation turns out to be; education. The question of education is rather ubiquitous more so in the developing nations of Asia & Africa fraught with a myriad other problems. Rightly so, the heads ‘national’ & ‘international’ made little sense here & were omitted altogether. Although speaking from an exclusively Indian perspective the universal dissemination of education would precipitate salutary effects both in terms of social as well as individual well being. The vast population with a large number of young people in India would mean, the nation is predisposed to reap the dividends of an apparent demographic advantage over other nations provided that the populace is an ‘asset’. The industrial nature of modern civilization requires that people posses ‘tradable’ capacities to survive in a world where anything other than a ‘commodity’ holds little value. As such equipping people with necessary set of skills was never optional but, a provident investment into our collective future. No doubt, India, over the past years has consistently striven to build an institutionalized system to improve upon the exclusionary colonial educational system whose only aim was to create a pliant & conforming crop of elites who’d protect their vested interests. Children from the poorest 5th of population have a NAR (Net Attendance Ratio) of 18% (rural) & 23% (urban) whereas the richest have a NAR of 53% (rural) & 66% (urban). 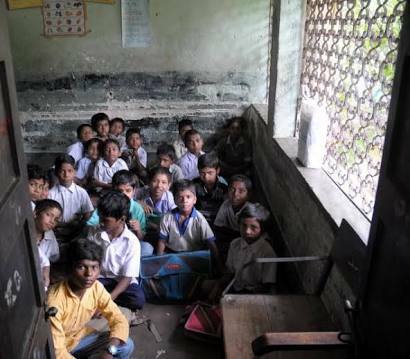 The modern educational apparatus in India accentuates social inequality. Those at the nether end of social strata: Dalits, Adivasis & vast majority of India’s Muslims may never reach the same material affluence as the others, not out of their own failings but, more because of a system that actively dissuades them from seeking parity with the others. If this wasn’t the case, how’d one explain the disproportionate dropout rates, the wage gap & the malnutrition level among the vulnerable sections of the society? Nearly half of standard V students were not able to read standard II text & the same proportion didn’t have basic arithmetic skills, reported the ASER 2014. Beyond the clamor for purging the national curriculum of Marxist influence & rendering a nationalistic interpretation to history those in power ought to invest more into ensuring that people regardless of their social standing may break free from indigence & social stigmas; the great afflictions of our times.